The Company of Animals Treat Bag is a practical bag that has been designed with many useful features. With a wide opening to allow easy access to treats, the bag also features a drawstring closure to ensure that it is rain and dog thief proof. 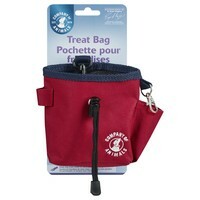 On the back of the Company of Animals Treat Bag is a separate zipped compartment for personal items, and in various places around the bag are specifically designed holders for other Company of Animals equipment (sold separately). Finally there is a clip and belt loop for easy attachment. Great treat bags made of strong material, clip onto trousers of cot, easy access to treats plus a pouch for putting a clicker in, hard wearing and a good buy.i reccommend these to people in my dog training classes.